barry @146, the criticism that several of the abstracts were publicly discussed on the SkS forum, contrary to the statement in the paper that ratings were "independent" at the first stage, is correct. I do not have a hard figure on how many were discussed, but it is more than 10 and likely less than 20. Of those discussed, many (possibly most) were simply posted with a note that it was odd, or interesting and with no discussion of the appropriate classification or rating. Others were posted with the posters own classification but no further discussion. These instances do contradict the claim in the paper that, "Each abstract was categorized by two independent, anonymized raters." With just 10 to 20 instances, ie, less than 0.2% of instances, to say the claim that the raters were not independent would be misleading. Never-the-less it could be argued that these abstracts should be excluded from the analysis. Of course, from among those I have examined, the were either excluded as "not climate related", rated as neutral or, in one instance, rated as rejecting the consensus. Consequently I don't expect any demands in that direction. Given the very low number of abstracts involved and the very high number of abstracts surveyed, there is no question of these instances having distorted the result. Indeed, it is not even known that it would have changed the rating of any given paper so it is entirely possible that it would have no effect on the result. In fact, the only person at Lucia's to have mounted criticisms of any seriousness is Lucia herself. I think she is wrong either on the substance of significance of her criticisms but at least they are criticisms worthy of consideration. The rest of the criticisms are completely inconsequential, absurd, or in at least one case outright dishonest. Did you actually try the rating exercise yourself? Yes, twice in the public survey rating the 10 abstracts. The second time i loked up the full papers to see how the full text compared with the abstracts. I found, as most others did, that the full papers were more likely to express an opinion that the abstracts. I believe I understand what neutral means, and I certainly don't think it implies a rejection of the consensus. But neither does it imply endorsement. I disagree that options 1, 2 and 3 support an endorsement of the anthropogenic influence of global warming is greater than 50%. only option does. The endorsement statement in the email received by original authors is given in the supplementary material. Can you explain how options 2) and 3) endorse a >50% contribution to global warming from humans? A comment disappeared - don't know if my posting status has changed. Jason, i've read the paper and the supplementary material quite carefully. The supplementary material gives the email sent to original authors with the endorsement statemtn (which mentions nothing about degree of human influence) and the options. Can you explain how options 2) and 3) endorse >50% human influence on global warming? I don't think they do at all. Only 1) specifically states this. The other 2 are unquantified, as the paper attests. I don't believe 97% of papers/abstracts gave exlicit endorsement 1) to the notion that human activity is responsible for global warming. I think 97% of papers gave unquantified + explicitly quantified endorsement that AGW is happening. "I don't believe 97% of papers/abstracts gave exlicit endorsement 1) to the notion that human activity is >50% responsible for global warming. I think 97% of papers gave unquantified + explicitly quantified endorsement that AGW is happening." First: The title is part of the definition of the categories, as viewed by both raters and authors. And category 2 "Explicit endorsement without quantification" is just that, endorsement of the AGW consensus. If a paper treats AGW as not the dominant influence, it's not endorsing the consensus, and shouldn't be rated as Category 2. Ratings are not just off the description (a refinement), but also the category title itself. And somehow, I cannot see an author whose paper rates AGW as a minority influence would voluntarily rate it as explicitly endorsing the consensus. Second: Category 3, "Implicit Endorsement: Implies humans are causing global warming. E.g., research assumes greenhouse gas emissions cause warming without explicitly stating humans are the cause", is a clear endorsement of human caused global warming if you understand that greenhouse gas emissions are caused by humans. Therefore, unless there is a statement in the abstract or paper that increases in GHGs such as CO2 are from natural causes, rather than anthropogenic (very much a minority view), this is indeed an endorsement of the consensus. Because, quite frankly, the evidence for human driven increases in CO2, CFCs, and the feedback from water vapor is overwhelming. First, I would like to commend you guys for putting the time and effort to do this. However, I think the 97% consesus is misleading. The article states, "We found that about two-thirds of papers didn't express a position on the subject in the abstract, which confirms that we were conservative in our initial abstract ratings." 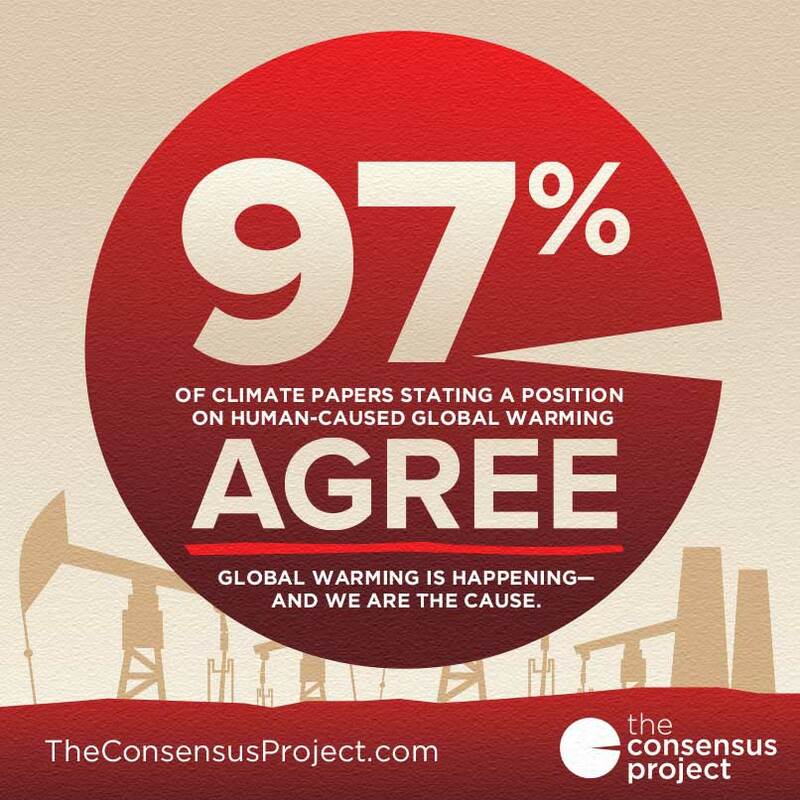 Thus, the 97% consensus is only for the papers that expressed a position on the topic of AGW. Therefore, out of the total sample size of 12,000, the number of papers that expressed support of AGW in their abstract was actually 32% . And 1% expressed disagreement or uncertainty with AGW. Thus, 67% of the abstracts didn't have a position. "This result isn't surprising for two reasons: 1) most journals have strict word limits for their abstracts, and 2) frankly, every scientist doing climate research knows humans are causing global warming. There's no longer a need to state something so obvious. For example, would you expect every geological paper to note in its abstract that the Earth is a spherical body that orbits the sun?" While the first one is true, it still doesn't tell us the author's position. The actual authors may or may not support AGW or maybe unsure. The second one looks like a personal opinion. It seems illogical to just ignore the 67% of papers that didn't express an opinion in their abstracts. Especially since the keyword searches used to find the papers, "global warming" and "global climate change," are sensitive topics with proponents pushing for drastic emission reductions. Also that UIC paper that is cited asked 2 questions in its online survey. "1. When compared with pre-1800s levels, do you think that mean global temperatures have generally risen, fallen, or remained relatively constant? 2. Do you think human activity is a significant contributing factor in changing mean global temperatures?" 76 out of 79 climate scientists answered risen to question 1. 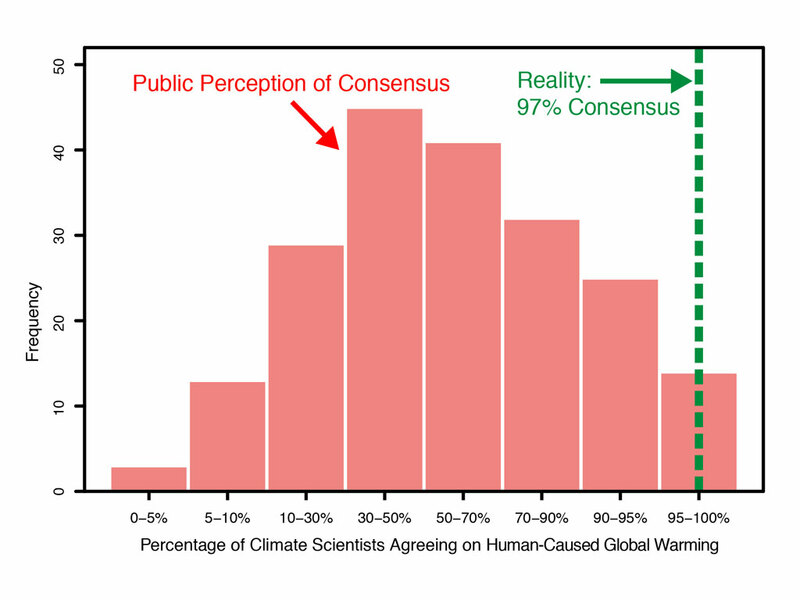 The 97% consensus comes from the 75 out of 77 climate scientists that responded yes to question 2. But question 2 is subjective because it doesn't state what % is considered siginificant. Significant could be 10%, 20%, 50%, etc of observed warming. just my 2 cents. Further to KR's comment, the reason I mentioned the 5, 6, and 7 categories was because each cateogory must be considered in the context of all the others. If the abstract says anything that can be interpreted as "human activity is <50% responsible for global warming" it would have automatically shunted it into category 5, 6, or 7, whether it was implying it, stating it, or exlicitly quantifying it. And if it did not go either way, then it was neutral. engineer @ 157... Well, no one ignored the "no position" papers. It's discussed quite extensively in the paper. You're not noting the fact that, when the scientists rated their own papers, that 66% dropped to 35%, yet the consensus figure of papers that state a position stayed nearly the same. That, in and of itself, suggests a level of robustness to the conclusions. I'd be asking for my money back. Perhaps you haven't seen my earlier comment, among many others' comments that already addressed this point? Perhaps you can explain why a number that would be invariant regardless of how many irrelevant papers are considered is less important than a number that can be changed at will simply by adding more papers to the set of papers that must be manually considered? To me, it seems illogical to include papers that are irrelevant to determining the question at hand but I look forward to your explanation. Especially since the keyword searches used to find the papers, "global warming" and "global climate change," are sensitive topics with proponents pushing for drastic emission reductions. Are they? Tell me, what topics should researchers use who are simply reporting on some scientific results so they can avoid these "sensitive topics" with unnamed "proponents"? That's what all the papers I looked at were doing, and, as I've mentioned before, all the "neutrals" I saw clearly accepted global warming was occurring (and were reporting on some aspect of the consequences), it's just that they didn't mention the cause of it in their abstracts. Since they did give any indication on the cause, they were irrelevant to the question at hand, just as the vast majority of papers published in the scientific literature. Should they be included in the total too, so the two percentages become ~0% and ~0% (while still maintaining the same ratio)? Or should we focus on the papers that actually have a bearing on the question at hand? "Two comments, with the understanding that the "concensus on AGW" means AGW as the dominant force behind global warming:"
"If the abstract says anything that can be interpreted as "human activity is <50% responsible for global warming" it would have automatically shunted it into category 5, 6, or 7"
It seems I have been labouring under a misapprehension, then. But I wonder if I am alone in that. The email sent to original authors makes no mention of the consensus being about degree of warming. The Endorsement statement in the email only mention humans contributing, not being a primary source. Then they get the 7 rating options, 2 of which are quantified, and the other 5 are qualified. The Author reading the email it must infer that all 7 ratings are under the rubric of >/<50% human influence, rather than (as I did) view the remaining 5 ratings as qualitative, rather than quantitative options. Scientists must make an assumption about that because it is not expressly stated, and in the manner that it is stated in the email, it does not mention degree of human influence at all. "Among abstracts expressing a position on AGW, 97.1% endorsed the consensus position that humans are causing global warming." Throughout the paper, apart from the one sentence in the intro, the values are tied to the phrase "the consensus" or similar. My concern now is, that with different interpretations of the consensus statement (and different scientific societies and position statements also word the consensus differently, some only going as far as saying that human activity is contributing to global warming), the original Authors may have rated as I did, applying to all but options 1 and 7 a qualitative interpretation of abstracts. Possibly I am just ignorant or not too bright. They said so at Lucia's, where I have been arguing, against them there, that the 97% result has come from a simple accept/reject AGW. I really do find it incredible that 97% of abstracts endorse >50% human influence, implicatively or otherwise. BTW, are any of the authors commenting here? It would be great if they did and identified themselves (unless they prefer anonymity), so that they could clear up misunderstandings. Hey, John Cook, come straighten us out. Climate change is a sensitive topic and proponents of AGW do mostly support drastic cuts in emissions. I don't know why you took offense to that statement. Anyway, 7,930 papers (66%) had No AGW position. 1,339 of these were then self rated and of the 1,339 36% were self-rated as no position on AGW. Since you worked on the paper...How many of the No AGW Position papers and self rated No AGW Position were on the topic of climate change? You're wondering why I consider the overall percentage number to be relevant. It is interesting that 66% of the overall 12,000 and 35% of the 2,142 respondents had no stated AGW position in their paper. Why? If those papers are on the topic of climate change (I don't know if they are that's why I asked the above question) and the authors support AGW, then I would expect them to mention human CO2 emissions because a) humans are driving climate change through emissions and b) we're running out of time and scientists have to convince governments that humans are behind climate change so we don't kill ourselves. and reason number 2 doesn't cut it for me. " 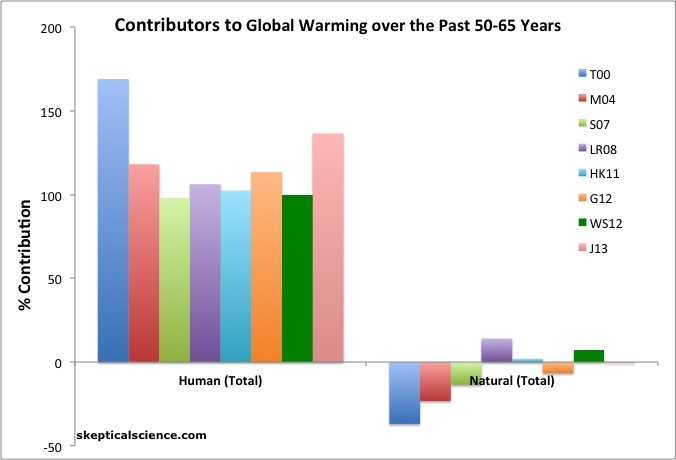 2) frankly, every scientist doing climate research knows humans are causing global warming. There's no longer a need to state something so obvious. For example, would you expect every geological paper to note in its abstract that the Earth is a spherical body that orbits the sun?" The paper itself and the UIC survey cited above refute this. I doubt you can find a geologist that doesn't believe that the Earth is a spherical body orbiting the sun. just my 2 cents. that's why I thought the 97% consensus was overemphasized. 1) Lucia's argument that the IPCC consensus in 1990 was not that greater than 50% of warming due to anthropogenic factors is valid. The concensus position has evolved over time, a factor not properly recognized in the concensus project. How significant is that? Well, using the figures from Carrick's "scrape" of the data, I excluded all affirmations prior to 2001 but did not exclude any rejections. The result: Affirmations are 97.5% of the sum of all rejections and 2001 to 2011 affirmations. So, even if we exclude all affirmations prior to 2001 because the consensus position was not as well developed then, the result still stands. 2) Further, I also tried excluding all implicit affirmations (but no rejections) from the result. The result is that affirmations are still >80% of the sum of affirmations and rejections in all years, and average 95.35% of the sum of affirmations and rejections in all years. It cannot seriously be believed that 100% of implicit ratings are false positives, even on the stricter criterion that the projects participants believed applied (and rated according to). But even on that absurd assumption it makes nearly no difference to the result. 3) You are correct that authors may have used a less strict interpretation of the criteria than the abstract ratings. If true, however, it would merely partially explain why author ratings rated the papers as far more supportive of the concensus, and would have no implications about the validity of the abstract ratings. So, even allowing absurd amounts of credence to the arguments of Mosher and Lucia, the actual impact on the result is minimal. Lucia keeps on saying she will get around to producing numbers to analyze her intuitions. Frankly, if she were serious she would not blog on the subject until she produced those numbers. I believe she relies on the fact that gullible people will accept her mere pointing to a possible flaw as thereby establishing a fatal flaw in the paper. In reality, however, she is at best nitpicking. Finally, you can find out all the numbers you need for your own analysis by going to the searchable database and searching each distinct category (by year, rating and topic) with the search term "i". It takes about half an hour to get full tables of the data. Bye now for a month or so. Arg, me hearties, I've been learnin' me numbers. Need to divvy up the booty fair 'n square. Burden of bein' a cap'n, an all. A week past I got cut in a fight with Leftie Jake. So I got to wonderin', what proportion of sailor dogs is right handed? So I calls the crew on deck, all three 'undred men, and I asks 'em "Which hand do you dogs like to use yer cutlass in?". Ninety seven of them says "Right". Two says "Left". Roberts says "Both", the blaggard. The other two hundred? They're cussin' me and yelling "I've only got one 'and". Except for two-hooks Jim who fixes me a stare that's blacker 'n pitch. So this is what's puzzlin' me. Is the proportion of sailor dogs that's likely right 'anded 97% (ninety seven of an 'undred), or 32% (ninety seven of three 'undred). Engineer: Can you explain Captain Bluetooth's confusion? Re-reading the thread at Lucia's, I see Zeke Hausfather reads the ratings much as I did, and I know he's no dummy. So if he did, and I did (and some others at Lucia's), how many original authors did? Regarding Tom' points, if original Authors believed that options 2, 3, 5 and 6 were not related to >/<50% influence, but qualitative statements, then that may have a significant impact on results expected under the rubric given here. Almost everyone agrees, including the (better-informed) skeptics, that AGW is real and happening. This is the public perception that John Cook has stated he is combatting with this paper - that AGW is real and happening, which public announcements may also have confused me and others as to what the consensus position is that the paper is investigating. A concise statement in the abstract of what the "consensus position" is as investigated by the paper would have obviated a considerable amount of confusion. Engineer wrote "Why? If those papers are on the topic of climate change ... and the authors support AGW, then I would expect them to mention human CO2 emissions"
I can give you an example with which I am familiar. I have done some work on statistical downscaling (essentially trying to work out how climate change will effect sub-regional scale climate from the larger scale climate projections provided by GCMs). As this only looks at the statistical relationships between large scale and sub-regional climate it is pretty much independent of the cause of the climate change. This means that there is no specific need to take a stance on the cause of the climate change as it isn't directly relevant to the methods described in the paper. Some papers do mention emissions scenarios (IIRC the paper I authored [which isn't in the survey] does, but I can't remember if it explicitly attributes any proportion of climate change to anthropogenic emissions), and some don't, basically at the author sees fit. Something worth bearing in mind is that scientific papers are generally written for other scientists, not for the general public,and they definitely are not generally written to resolve common myths in climate blogs (although there are exceptions). As a result, they tend not to state the bleedin' obvious, and they tend not to draw conclusions on topics that are not directly supported by the evidence presented in the paper. In the case of a downscaling paper, the results basically show how well you can predict historical local climate from supra-regional climate, so it doesn't in itself say anything about the cause of climate change, even though the authors fully agree with the mainstream position on attribution. Essentially, not all papers on climate change are on the question of what causes how much of it, so not all papers explicitly make a statement on attribution. @ Kevin...You didn't understand my post at all. I don't disagree with the 97% number. It's like voting if people don't vote they're not part of the total so u use the subset that actually voted. But that's not my point. Please read my comment 162 to understand what I'm talking about. Whatever, it was just my opinion on the topic anyway. The proposition put to the authors in the email is "that human activity (i.e., anthropogenic greenhouse gases) is causing global warming (e.g., the increase in temperature)", as you quoted. They were asked to assign the level of endorsement of their paper to the proposition that human activity is causing global warming. If you read the description of each level you'll see that the difference between 1, 2, and 3 is not how strongly they agree with that proposition, nor what percentage of human involvement there is, but rather the manner in which that endorsement was expressed. In other words, it is not that level 1 is "I am absolutely certain that humans are responsible for > 50%" and level 3 is "I'm reasonably sure that humans are responsible for > 50%" (i.e. degree of confidence), or that level 1 is "Humans are responsible for > 50%" and level 3 is "Humans are responsible for > 10%" (i.e. degree of responsibility), but rather than level 1 is explicitly stating the percentage of human responsibility and it is greater than 50% while level 3 is implicitly assuming human responsibility. Now it's possible that different people have different interpretations of the phrase "is causing", but to me it implies it is the major component, i.e. > 50%, and the authors of 97.2% of the papers with a position on AGW responded to the proposition that human activity is causing global warming by saying their paper endorsed that proposition, either by explicity quantifying the degree of human involvement, by explicitly stating that humans are causing global warming, or by implying that humans are causing global warming. If they felt their paper disagreed with that proposition, then levels 5, 6, and 7 were available for them to show how it expressed that disagreement. Which is pretty much what you would expect if you knew that downscaling was an area of research in climate change that had relatively little to do with attribution, and that scientists tend only to draw conclusions on issues that are directly addressed by the paper. I suspect the paper I co-authored would have been rated as "no postion" or "implicitly endorses but does not minimise", and three of my co-authors are from the Climatic Research Unit at UEA. You have a mistaken view of the motivations of scientists, scientific publications are generally rather understated. What makes you think I took offence? Surprised, maybe, that people post without reading first, but not offended. As I said in the earlier comment I pointed you to, there's nothing "special" about the 12,000 papers that were manually rated. They are simply what was left after applying the earlier filters. Manual rating was required to filter out the irrelevant papers from that set in order to arrive at what was actually desired, namely, the set of papers that were relevant to the question at hand, which was to determine the percentage of papers in the scientific literature that endorsed the consensus position that "human activity is causing global warming" vs the percentage of papers in said literature that rejected that position. The size of that set of papers with respect to the size of set of papers that required manual rating is mildly interesting but irrelevant. After all, with sufficient effort, they could have simply manually checked all scientific papers during that period, which should not have changed the relevant percentages but which would have reduced the percentages you're interested in to minuscule values. The purpose of the filtering was to make the problem tractable, that's all. Note that I am not an author of the paper. I, like many others, participated in the online rating exercise announced here a few weeks ago to get a taste of what was involved. I suggest you have a go, because by doing so you'll quickly realise the true nature of the papers that end up being rated neutral and why they don't make statements about the cause of global warming, contrary to your current expectations, but you'll need to try the more recently announced exercise instead, which appears to be very similar, because the former has already closed. Unless you know that the first 100 are representative of the 300, you can't make any comment on the 300. You can't assume anything. For all you know in your example is that right handed pirates hear better, so came forth with their reply before the left handed pirates did, or conversely, the left handed pirates hear better and come forward right away, and there is only three of them in total. I just attended a talk by James Hansen at NASA Ames Research Center. One of his main points right up front is that a big part of the problem is the large gap between climate scientists' knowledge and public perception of that knowledge. The best analogy I could think of to describe the current situation of the large gap between the publics' knowledge and published climate scientists is the knowledge gap between the passengers of a very large airliner and the flight crew. Would you board an aircraft where the passengers have a vote on what control inputs should be used at all times. These votes would be open to the most shrill passengers that made the most noise without any knowledge or evidence. Even if the full instrument panel was displayed on all the screens in the passenger compartment the passengers do not even have the slightest idea of what they all mean. The self appointed 'knowledgeable' passengers who are not trained pilots are a cacophony of conflicting interpretations of how to fly the aircraft. They cannot even agree amongst themselves how their 'expert' opinions should be implemented. This is the situation Space Ship Earth finds itself in. we are agreed that different interpretations are possible. This is a weakness of the consensus statement sent in the email, and the ratings scheme. The only way I can think to test for differences is to email all the Authors who rated to clarify that they though was meant by options 2 and 3. A subset of respondants should give a clue. Because if a good number of respondants interpreted as I, Zeke Hausfather and a number of other reasonable commenters did, then the bar for them was much lower than yours/Cook et al, and this would significantly weaken the results. For example, Cook et al's claim that their ratings were more conservative than the original Authors' would be undermined. Consider Dana Nuticelli's comment at another blog on the Cook et al ratings as he sees it. Note that if a paper said humans are causing less than 50% of global warming, or that another factor was causing more than 50% (or ‘most’, or some similar language), we put it in our rejections/minimization of the human influence category. Our basis was the IPCC statement that humans have caused most global warming since the mid-20th century. But if a paper simply said ‘human greenhouse gas emissions are causing global warming’, that went into the endorsement category as well. After all, there’s no reason for most climate research to say ‘humans are causing >50% of global warming’ (except attribution research), especially in the abstract. Huh? If a paper (abstract) simply said anthro GHGs are causing global warming (with no quantification), that went into the endorsement category. It seems that the raters (or Dana at least) assumes that any paper that endorses the notion of GHGs causing global warming, perforce endorses a >50% human contribution. I think you (and others I saw at the earlier link you posted) are getting hung up on the "> 50%" figure, when that is not the outcome of the survey, it was a tool for categorising a certain subset of papers. 97% of climate papers stating a position on human-caused global warming agree global warming is happening and we are the cause. Every one of them is consistent. Not one of them mentions the >50% figure. Why? Because the point of the exercise is whether global warming is happening and we are the cause. The only reason categories 1 and 7 exist is because some papers actually quantify the various causes, and so in papers that quantify the human contribution, the rule was > 50% counts as an "endorse" while < 50% counts as a "reject". That's all. If the graphic said "97% of climate papers state that humans are responsible for > 50% of global warming" then you'd have a point, but it doesn't. As I said, the numbers 1..7 are not meant to be interpreted as a confidence levels, or degrees of agreement with the proposition, but merely to categorise the manner in which the agreement or rejection was expressed in the paper. The fact that the authors of 97.2% of the papers that stated a position claimed that their paper agreed with the proposition and the reviewers of the abstracts found that 97.1% of those that stated a position agreed with the proposition is very strong evidence to me that they used the same interpretation. I don't agree that this should be seen merely as a matter of opinion or interpretation. The email is very clear. The paper is also very clear. The only thing I would change is the word "level" rather than "category" since that is apparently confusing some people. Dana's comment is also saying the same thing. Our basis was the IPCC statement that humans have caused most global warming since the mid-20th century. If that was the basis (and you, argue that ratings 5, 6 and 7 should be viewed as rejection of AGW at >50%, implying, in a symmetrical ratings scheme, that 1, 2 and 3 are endorsement at>50% (implied or explicit)), then I don't see much wriggle room. 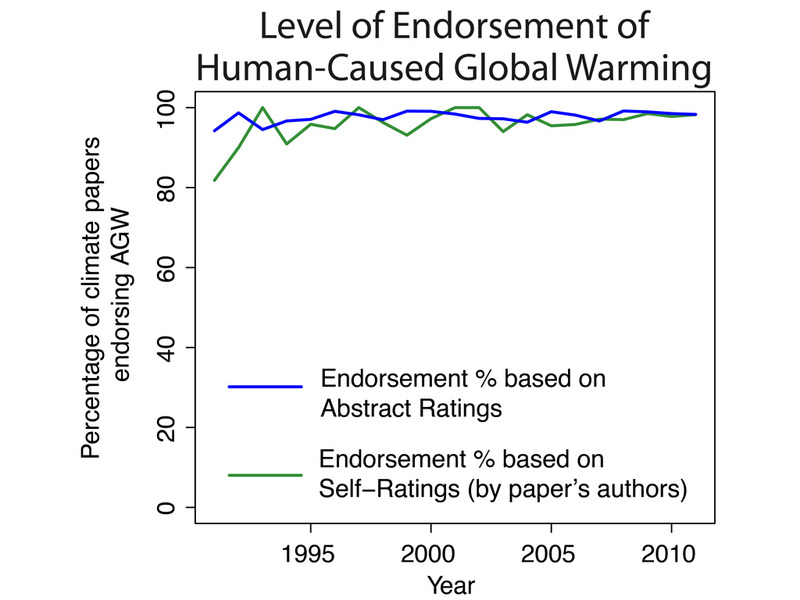 Can you clearly state in a sentence, if you think ratings 2 and 3 refer to an endorsement at >50% level, or only that anthropogenic warming is signficant in a qualitative sense. Just something clear and simple. It would be good to have clear statements from others. I'm pretty sure Tom Curits was arguing that 2 and 3 are >50% endorsements. It is confusing in the paper, as other statements on what the consensus is are less exact, as in the abstract. It is confusing in discussions about it because there is little agreement on what the ratings reflect. This disagreement does not fall on ideological lines (regulars at Lucia's are arguing about them, too). The problem is that the definitions are unclear and open to misinterpretation. It doesn't matter that results are so similar if there is ambiguity in the methodology. Indeed, if Cook et al have a unified understanding that is different to interpretations made by original Authors, then that is a problem, weakening a number of key points in the study, namely to do with corroborating the impartiality/conservatism of Cook et al. The close matchup of results may be a result of these extraneous factors due to the ambiguity of definitions in the ratings schema. It can be argued that 'primary cause' or 'dominant cause' of global warming could mean as little as 33%, if other contributing factors are each not greater than 33%. Is this what 2 and 3 refer to? It's simply unclear. I'd like to know in simple terms how others view the ratings. When I took the survey, I only applied >50% to 1 and 7, and the rest were qualitative. If Cook et al rated all but option 4 as an endorsement/rejection at 50% human contribution, then they rated differently to me, and possibly to many of the responding Authors. From new estimates of the combined anthropogenic forcing due to greenhouse gases, aerosols and land surface changes, it is extremely likely that human activities have exerted a substantial net warming influence on climate since 1750. Greenhouse gas forcing has very likely caused most of the observed global warming over the last 50 years. Greenhouse gas forcing alone during the past half century would likely have resulted in greater than the observed warming if there had not been an offsetting cooling effect from aerosol and other forcings. It is extremely unlikely (<5%) that the global pattern of warming during the past half century can be explained without external forcing, and very unlikely that it is due to known natural external causes alone. The warming occurred in both the ocean and the atmosphere and took place at a time when natural external forcing factors would likely have produced cooling. Given that as the widely understood "consensus", I find claims of categories 2 and 3 not supporting a majority factor for human causes to be simply ridiculous. And yet, KR, the ridiculous interpretation is how many reasonable people have taken 2 and 3. Can you explain why abstracts saying "human greenhouse gas emissions are causing global warming" means that they are, perforce, positing >50% human influence? The quote I've just given is from Dana, one of the authors of Cook et al, and that unquantified statement was suffcient for the abstract to be rated as endorsing. Let's consider the original authors' ratings for the moment. The authors were sent an email. That email quite clearly said, as you have already quoted yourself, "The second drop down indicates the level of endorsement for the proposition that human activity (i.e., anthropogenic greenhouse gases) is causing global warming (e.g. the increase in temperature)." They are not being asked to quantify the human contribution, nor state their certainty of the human contribution, but merely to say whether their paper endorses that proposition, rejects that proposition, or doesn't address or mention the issue of what's causing global warming. The very next statement says "we are not asking about your personal opinion but whether each specific paper endorses or rejects (whether explicitly or implicitly) that humans cause global warming". Then the seven "levels" are stated, and, sure enough, the only difference between 1, 2, and 3 is the manner in which that endorsement is manifested in the paper (i.e. implicitly or explicitly, and if explicit, with or without quantification), and the only difference between 5, 6, and 7 is the manner in which that rejection is manifested in the paper, in exactly the same way as the endorsement case. Note, for example, that a paper classified as "level 1" could easily be less "alarmist" than a paper classified as "level 2" or "level 3". A level 1 paper is likely to be an attribution study whereas a "level 3" could be an impacts study and, as such, could well be far more alarming. As I mentioned in an earlier comment, someone else at Lucia's managed to confuse the levels with a measure of climate sensitivity, which is nonsense. There is only one proposition being put, and that is whether humans are causing global warming or not. Note that it's really quite a strong statement as well. There's no wriggle room here. If someone wrote a paper that accepts that greenhouse gasses cause global warming, and that humans are responsible for GHG emissions, but that e.g. natural variability had a larger role to play in the warming to date than humanity, their paper would be classified as rejecting the proposition. This is simply a restatement of the IPCC consensus statement, quoted by KR, and it doesn't matter if other restatements of it elsewhere in the paper are less precise because this is the proposition they are evaluating. No. If a paper quantified the human contribution to global warming at 33% then regardless of other contributing factors it quite clearly would have been categorised as "level 7": "paper explicitly states that humans are causing less than half of global warming". There is no room for interpretation here. Level 1's "Explicitly states that humans are the primary cause of recent global warming" has to be read in the context of Level 7's "Explicitly states that humans are causing less than half of global warming", which rules out any possibility other than ">= 50%" for Level 1. Likewise, levels 2 and 3 are symmetric with levels 6 and 5, respectively. Because the hypothetical abstract says that human greenhouse gas emissions are causing global warming? Just because the statement omits a number doesn't mean it isn't endorsing the proposition, which didn't include a number anyway. As I've already pointed out, the graphic makes the statement that "97% of climate papers stating a position on human-caused global warming agree global warming is happening and we are the cause". How can you argue that a paper that says exactly the same thing — that human greenhouse gas emissions are causing global warming — should not be categorised as endorsing that position? And again, I'll point out that the original authors, given the explicit request to state whether their paper endorses the proposition, rejects the proposition, or doesn't address it, gave the same percentage of endorsements and rejections as Cook's team did, even while finding that many papers that Cook's team relegated to "neutral" on reading the abstracts alone actually did make a statement when the whole paper was taking into account. Jason, I'll point out again that the match could still be a coincidence if the Authors interpretation of the ratings system for their papers, was different than Cook et al for the abstracts to those papers. Post hoc reasoning is not acceptable. ...the graphic makes the statement that "97% of climate papers stating a position on human-caused global warming agree global warming is happening and [A] we are the cause". How can you argue that a paper that says exactly the same thing — that [B] human greenhouse gas emissions are causing global warming — should not be categorised as endorsing that position? [A] implies human influence as the dominant - in fact the ONLY cause. Whatever interpretation is taken, there is no doubt that the consensus is that human activity is causing at least some global warming. Perhaps participants here could select which of these statements is most accurate. I think either of those are valid for rating options 2 and 3, depending on how the email is interpreted. My own take doing the (public) survey was c). To clarify, c) - significant influence - was what I took to be the criterion for rating options 2 and 3 when I participated in the public survey. But another person might have rated those with a lower (d) or higher (a,b) bar. Lack of clear definitions is a problem for the paper as I've argued upthread. If Zeke was here, I think he'd say c) and/or d). Next we'll be arguing what the meaning of "is" is! I said that the statement Cook et al were testing was very strong, so let's look at what you claim the "consensus" is: "that human activity is causing at least some global warming". Papers classified by Cook et al as levels 1-3 would obviously also agree with your claim. But so would papers classified by Cook et al as level 5, some of the papers classified by Cook et al as level 6, and any of the papers classified by Cook et al as level 7 that had a percentage greater than 0. In other words, the only papers that Cook et al counted as rejecting their proposition that you would also claim reject your rendition of the consensus are those in level 6 that explicitly reject that humans are causing global warming and those in level 7 that state humans are causing 0% or less of global warming. Clearly, Cook et al's statement is a lot stronger than yours, as it filters out many possible papers that you would consider endorsing your consensus. I would guess that very close to 100% of the papers would pass your test. Finally, to point out that the authors of the original papers, when asked if their papers endorsed the claim that human activity is causing global warming, resulted in the same percentage of endorsement as Cook et al did by examing the abstracts alone, is not "post-hoc reasoning", it's evidence that the same criteria were applied, because it would be absolutely staggering for both groups to have arrived at the same percentage by coincidence, especially when the original authors added a large number of extra papers to the mix that Cook et al were forced to assess as "neutral" based on the abstracts alone. It also means that the abstract examination process provided an unbiased estimate of what the full paper would actually say. I've been playing with the search tool to tabulate the results; I managed to collect results for 11,942 papers using a space as the search term; that's two fewer than Cook et al. Curiously, I ended up with exactly one extra paper in levels 1-3, two fewer in level 4, and one missing in levels 5-7. Could have been a typo when I was entering the numbers into the spreadsheet, although I just double-checked level 4 and got exacly the same result. For the papers that make explicit statements about causation without quantification, those that explicitly state humans are causing global warming represent 98.4% of the total (923 of 938). For the papers that imply the impact humans are having, those that imply humans are causing global warming represent 98.2% (2910 of 2963). My figure for the overall endorsement percentage is 98.06%. Not sure why the paper gives a lower figure. In any case, no matter how the results are spun, or words are interpreted, it is pretty clear that the literature falls heavily on one side. I think anybody who seriously wants to challenge the results really needs to show papers that were mis-categorised; all the abstracts are available together with the category that was applied, so nothing is hidden, and if someone wants to apply their own "interpretation" to the rating system they have the means to do so. Perhaps, to make the problem more tractable, they could start by checking for papers that they know disagree with the consensus and make sure those show up in the right place. Can we please stop talking about consensus. Science isn't about a show of hands. There used to be consensus that "bleeding" a patient solved most medical problems. So called consensus has proven to be wrong too many times in the past. Let's stick to scientific evidence. barry - "And yet, KR, the ridiculous interpretation is how many reasonable people have taken 2 and 3." Reasonable people? Perhaps... But many of the people raising this issue (this obfuscation, in my point of view) are not climate scientists, and are not as aware of the IPCC reports. Or at all fond of of the IPCC and its conclusions, for that matter (cf motivated reasoning). "Can you explain why abstracts saying "human greenhouse gas emissions are causing global warming" means that they are, perforce, positing >50% human influence?" Definitions of each level of endorsement of AGW. I'm making no claim as to what the consensus statement is meant to be. barry, the authors were asked to state whether or not their papers endorsed the proposition that human activity is causing global warming. I agree. But if Authors rating at 2 and 3 (which comprise a huge bulk of the endorsement ratings) take that to mean anything between, say, 'some' influence and >50%, and Cook et al take it to mean >50%, then the rating criterion is different and this may signficantly affect the comparitive results. Would I be correct in assuming you would say that options 2 and 3 rate the human influence on global warming as dominant (b)? Lucia, excluding papers dealing with impacts and mitigation, 92.9% of papers surveyed (and that indicate a position in the abstract) implicitly or explicitly affirm that >50% of recent warming is due to anthropogenic causes. Apart from 1 and 7, none of the ratings are quantified. The descriptors are "endorses" and "minimises" AGW. These are qualitative statements, and that was how I read them. That is also how Zeke Hausfather read them. Categories 2 and 3 as well as 5 and 6 do not make any explicit assertion of attribution percent (e.g. they don’t assert < 50 percent, they simply don't provide enough information to imply a percent). That 2, 3, 5 and 6 relate to >/< 50% human contribution may be inferred in context, but other inference is also possible. My point is, if reasonable people disagree on the ratings criterion (and the 2 I've cited are 'friendlies', there is yet more disagreement between other parties), then original Authors may have had different interpretations, and this may well undermine the comparitive results that are a strong corroborative feature of the paper. The similarity of results could be a fluke. The only way to test that, that I can think of, is by asking the original Authors who rated their own papers what they assumed the criterion was for 2 and 3 (and 5 and 6). If the point of the paper is to demonstrate there is a consensus that more GHGs in the atmosphere should cause some warming, then that is not as impactful as endorsing the IPCC statement. It's a much lower bar with a much smaller target audience. None of the contrarian climate scientsts dispute that, and neither do most prominent skeptics (including Anthony Watts, for example) and most of their followers. The basic message is fine - and the effort has been successful on that regard. I'm discussing the academic merit of the Cook et al study. You said "there is no doubt that the consensus is that human activity is causing at least some global warming". Cook et al's results are far stronger than that, as I already explained. I don't know how many times I can keep saying this; the original authors were asked whether their papers endorsed AGW. The results are being reported as the percentage of papers that endorse AGW. There is no discrepancy. What the general public wants to know is "is human activity causing global warming?". That's exactly the statement that the authors of 97.2% of the papers that expressed an opinion on the matter said their paper endorsed. QED. [JH] Be careful of excessive repitition. Jason said, "Next we'll be arguing what the meaning of "is" is!" Exactly. At this point Cook et al 2013 is part of the published research on this matter. If there are people like Lucia and others who wish to challenge the findings, they should do so by the way of publishing their own paper. They are more than welcome to craft their own methodology to test the level of consensus on AGW. But, like with the hockey stick, I think the results they would get would go against the conclusions they want to see, and to get the conclusions they'd prefer would require contortions that would not pass peer review. You state: I'm discussing the academic merit of the Cook et al study. What exactly do you mean when you use the phrase, "academic merit"? Claims identical to yours have been examined before and rightly dismissed, for three reasons. Second, the consensus of experts follows from the preponderance (or, if you will, the consensus) of the evidence, a point that has been raised on several occasions on this thread and any other occasion where the scientific consensus has been discussed. Third, research shows that the public perception of the scientific consensus is an important component of public advocacy for action to reduce emissions and mitigate global warming. So it is in fact critical, if we want to avoid the worst consequences of rapid global warming, to spread the word about the consensus. (*) In point of fact I have a hard time thinking of any case where a scientific consensus, in the modern sense, of over 90% of scientists has arisen that has actually been overturned, with the possible exception of what caused gastric ulcers. In past cases either the consensus was non-scientific, or there was no consensus position to speak of. rhjames said... "Let's stick to scientific evidence." You seem to be operating under the erroneous assumption that Cook13 is a survey of scientists (a "show of hands"). It is not. It is a survey of the published research. It's entirely likely that there is research within the survey that reflects different positions on papers coming from any one scientist. A researcher that has published a large body of research could potentially have papers that fall into each of the 7 endorsement categories. Certainly most of the researchers who have multiple papers in the study have them falling into at least two or more of the categories. So, really, the opinions of the scientists themselves matter little. What matters is what their data show. If there was ever a great example of self-skepticism, this was it. John Cook made sure that we tested our own biases here at SkS against the evaluation of the scientists themselves. And not just a few cherry picked scientists. We tested against a very large number of scientists. rhJames - firstly, a consensus does exist. Secondly, while a consensus is not proof of a theory, it is the only reasonable basis for public policy so it is important to know what it is. "Lets stick to the scientific evidence" _ well I wish deniers would but they instead prefer blog "science", cherry picking and misrepresentation. Cook13 is effectively a survey of the published scientific evidence. Earlier you claimed that there is a difference in meaning between the wording in the graphic and the wording in Dana's example of a paper that would be classified as endorsing the consensus ("we are the cause" vs "we are causing"). I propose a test: Can you give any examples of abstracts that were rated as level 2 or level 3 that you feel do not endorse the statement in the graphic? If your argument is correct, there should be papers that you feel do not support the claim and based on the number of them we can ascertain the impact that would have on the results. Note that unless you're going to do an exhaustive search, you need to count how many papers you looked at as well as how many examples you found. This is so we can get a percentage that can be used to estimate the impact. You can also propose what you view as the "correct" classification for the examples you find. Until then, this argument is merely academic. I'm having a problem interpreting this study. The banner conclusion is that "among abstracts expressing a position on AGW, 97.1% endorsed the consensus position that humans are causing global warming." But in the Results section it states: "To simplify the analysis, ratings were consolidated into three groups: endorsements (including implicit and explicit; categories 1–3 in table 2)..." This is where I'm experiencing a disconnect. Categories 2 and 3 are too ambiguous - as defined in table 2 - to equate to the consensus that humans are not only a cause of industrial era global warming but the dominant cause since the middle of the last century (at least). Am I not reading that right? And if so, shouldn't only those abstracts that take an unambiguous stand on the consensus of dominant human causation be counted and the others excluded in the same way that abstracts that take no stand at all were excluded? s_gordon_g... Instead of trying to over interpret the exact wording, take a step backward and look at big picture. ~97% of the research supports AGW. ~3% of the research rejects AGW. The way you're approaching it, you're completely missing the forest for the trees. This is a common "skeptic" tactic when faced with data they don't like.